Yao Ming retired from the Chinese national basketball team Monday at an unprecedented farewell ceremony held by the Chinese sports governing body, and was highly praised by State Councilor Liu Yandong. 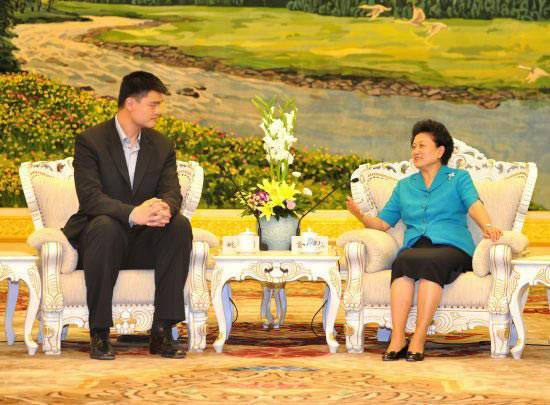 Liu Yandong received Yao at the Great Hall of the People and invited him to a dinner after the meeting. Liu praised Yao as one of the outstanding representatives of the Chinese athletes of the new era. Yao, 31, announced his retirement from the Houston Rockets of the National Basketball Association (NBA) in front of billions of Chinese fans on July 20 in Shanghai. This time at the closed-door ceremony that only invited media were allowed in, Yao received a series of top awards and greetings from his old-time teammates, coaches and friends. In Shanghai, Yao refused to clarify whether he would compete at the 2012 London Olympic Games for China. 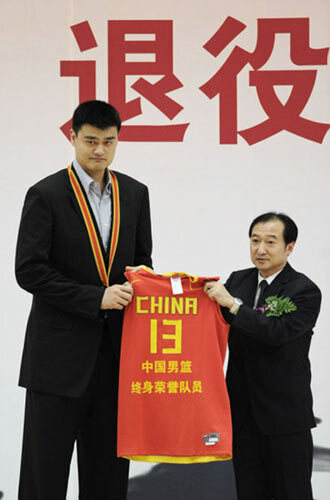 But Monday's ceremony officially called an end of Yao's day as a basketball player. 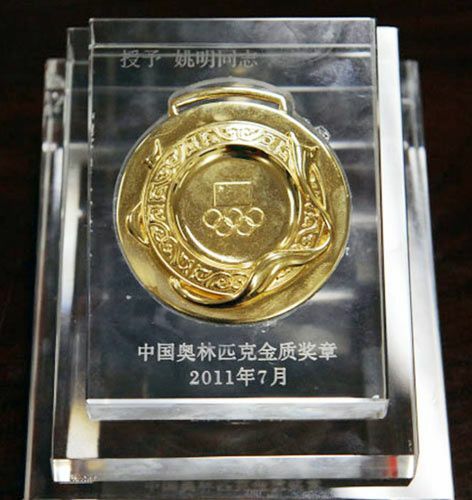 Xiao Tian, deputy director of the Genenral Administration of Sports of China, awarded the Olympic Order in Gold of the Chinese Olympic Committee (COC) to Yao. Jacques Rogge, the president of the International Olympic Committee (IOC), was the other person who received the award without winning a gold medal at the Olympic Games. Xiao Tian said, "Yao Ming receives overwhelming respects and love from fans around the world not because of his 2.26-meter height, but because of outstanding personality and the high goal of his career. I hope all the Chinese athletes should learn from Yao Ming." Yao also received an unprecedented retiring jersey of the Chinese men's national team, an award which was set up for him. Xin Lancheng, the director of the Chinese Basketball Administration Center, said, "Yao Ming is the most outstanding basketball identity in the history of the New China. He is the glorious model of the Chinese basketball players. He leaves to the Chinese basketball the priceless wealth, which will be cherished and inherited by a new generation of the Chinese basketball." Yao had attended three Olympic Games in 2000, 2004 and 2008 since he was selected into the national team in 1998. He was the first foreign player that was drafted by the NBA as the No 1 overall pick when he was chosen by the Rockets in 2002, and was voted as a member of the first team of the NBA All-Star for eight times.